Apple has seeded the all new very first OS X Yosemite 10.10.3 Beta 1 (Build: 14D72i) and Xcode 6.2 Beta 5 (Build: 6C121) Updates for OS X developers and non-developers (general public users) for upgradation / updation / installation with several new features and functionalities such as; all-new photography (photos) app for Mac and WatchKit support etc. The Direct Download Links of OS X 10.10.3 Beta 1 Delta / Combo Update .DMG Files are available on this post. According to OS X 10.10.3 Beta 1 (14D72i) release notes, Apple has brought some unique and much-anticipated features for Mac users i.e. Photos App to Support Photo Library, Customizable Emoji Characters, iCloud Photo Library, Bugs Fixes, Performance Enhancement, Stability Improvements and lots more as mentioned in below image. 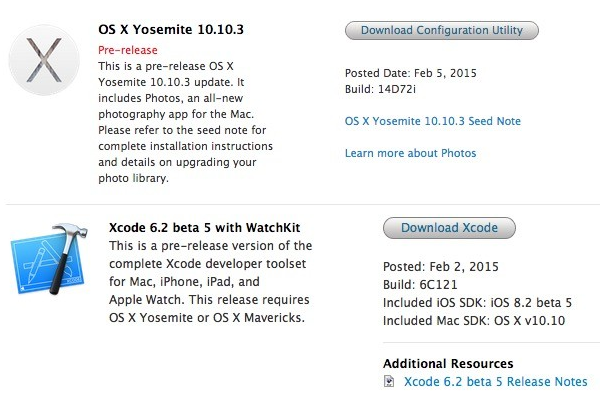 Whereas, Xcode 6.2 Beta 5 (6C121) includes; iOS 8.2 beta 5 SDK and Mac OS X 10.10 SDK with WatchKit support. 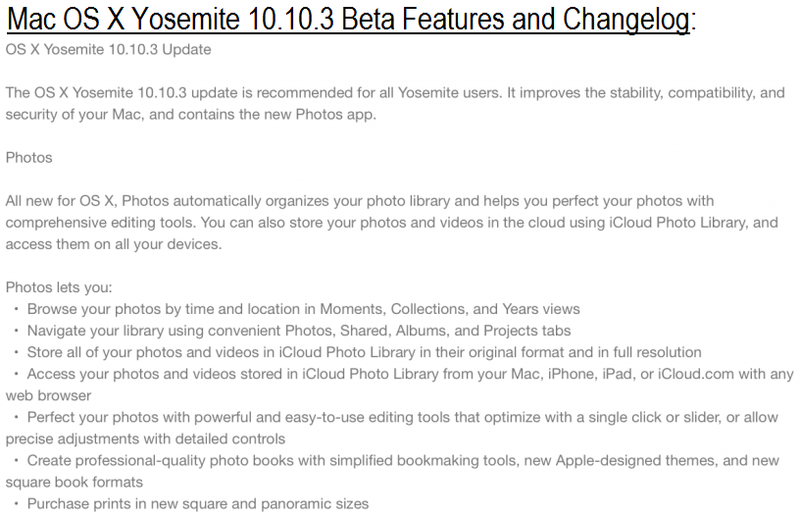 How to Download & Install OS X Yosemite 10.10.3 Beta 1? All Mac users can get the latest released of OS X 10.10.3 Beta Yosemite Updates through Mac App Store >> Software Update option. All Mac OS X developers can get the official OS X 10.10.3 Beta 1 Downloads via OS X Dev Center website. Whereas OS X non-developers can manually install and activate OS X 10.10.3 Beta 1 via iTunes for Free without Apple's developer account and UDID. Download OS X 10.10.3 Beta 1 Combo / Delta Update .DMG Files via Direct Links.